Meet our Wonderful Studio Owner: Michelle Lang! We are delighted to let you know that over the next few months Michelle will be gradually returning to the studio from her Maternity leave. Her first class back at the studio will be 22nd January - 6.30 Flow and 8pm Yin Yang. Book your spot here. My mission is to empower people to feel good, which will mean different things for different people. That is the beauty of yoga. Yoga is a very personal and not always easy journey of self discovery. My role is to facilitate this and help the practitioner to become aware of what they are feeling in their bodies and minds, as opposed to directing them and telling them what I think they should be thinking, doing or feeling. Along with this, I aim to be inclusive so that we can make the studio accessible for all. A down to earth and friendly approach. Coming to a studio can be a daunting experience. I like to create a warm and welcoming space that people can come along to and not feel judged or under pressure. 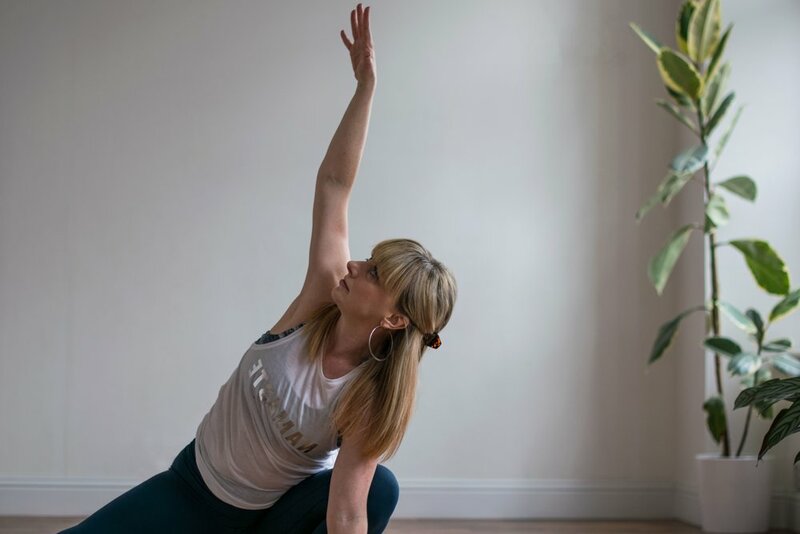 A diverse mix of people attend my classes and different variations of asanas (postures) are on offer to suit wherever you are at in your yoga practice. I teach in a way that gives you the control to pitch it to however you are feeling that day. So you have the option to slow it down if you are feeling tired or stressed or make it more dynamic and strong if you feel like a challenge. No matter what, I always make sure that people are given at least 10 minutes of relaxation/ meditation at the end. Expect to leave feeling relaxed, grounded and hopefully a bit more energised. What does your self care look like at the moment? I am nursing my baby son at so there have been a lot of adjustments in our household! Sleep, planning and preparing nutritious meals , moving my body and making sure I am drinking enough water are the most important things to me just now. It is hugely challenging to cover the basics when you have a new baby and if I manage these, I am doing well! I am also being gentle with myself as I am recovering from a c section. My mantra at the moment is accepting where I am at physically. I am exactly where I need to be and my body will heal. How has your yoga practice changed and developed over time? My yoga practice has completely changed pre and post natally. The physical aspect (asana) no longer feels important. My journey into motherhood has been all about surrender and my practice feels much more spiritual. My post partum body is different and I have been taking time to get to know it and adjust my practice to suit my new shape. I’d definitely say that my practice has became a much more nurturing experience. I have different favourites at different times! At the moment, it has to supported child’s pose. I feel like I am stretching my body but I am also grounding myself in a way that feels nurturing and supportive. It also makes me feel like I am retreating inwards, which is quite nice in Winter and at a time when everyone wants a piece of me! What advice would you give to someone who is just starting out on their yoga journey? Attend a beginners’ class with a teacher so that your practice can be supervised and you are learning the foundations properly and safely. Be aware that there are so many different styles of yoga and it’s about finding a practice that feels right for you, your body and energy levels. You might even discover that you enjoy practicing two very different styles side by side as they both compliment one another. It’s also great to practice with different teachers as they bring their own unique qualities or teach from a different angle. What do you do for fun when your not teaching/ practising yoga? I love hanging out with my new baby, making my house nice, going to the gym and getting fresh air as much as I can. Family and friends are really important to me and I love catching up with them. This usually always centres around food!